Kick off the autumn season with warm homemade pumpkin bagels, slathered in cinnamon cream cheese or maple butter! Since fall foods are my favorite, I offered to try my hand at hosting, with the help of Connie, author of The Foodie Army Wife. Bit of a bumpy ride, but I learned a lot. The harder part was deciding what kind of fall recipe to make! I’ve already blogged a ton of pumpkin recipes, a few apples recipes, a few butternut squash recipes. But you know what? Pumpkin will always be my FAVORITE fall food. But pumpkin what? And I thought my ideal fall day. What would I love to do? Well, I’d love to start it off by curling up on my couch with a magazine, a cup of coffee, and a warm breakfast. Not that that actually happens. You know, toddler and all. 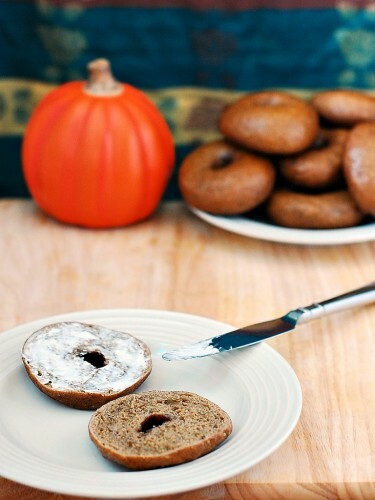 But what warm breakfast could be better than toasty pumpkin bagel slathered in a cinnamon cream cheese? Making bagels at home starts out like most yeast breads: mix yeast and sugar, then add flour, salt and flavorings. Knead, knead, knead. Let rise. Shape it. Let it rise again. But when making bagels, you add in the unusual step of boiling them before baking them. This sets the crust before baking even starts, and adds to the dense texture because the set crust prevents the bagels from rising too much. If you prefer softer bagels, shorten the boiling time to 30 seconds per side. These bagels smell so good, like spiced pumpkin. Baking them, and later toasting one, filled my whole apartment with the subtle aroma of pumpkin and cinnamon. What a great way to kick off autumn! These bagels are much smaller than you’ll get at a bakery or even buy in the grocery store, but I’ve always thought those bagels were over-sized anyway. These would probably be labeled “mini” bagels in a bakery, but I think they are the perfect size for a satisfying breakfast. Because these bagels don’t contain any preservatives, I recommend storing them in a zip-top bag in the freezer, and just pulling them out as needed. In the bowl of a stand mixer, combine the warm water, yeast and brown sugar. Let sit for 3 to 5 minutes. Add the pumpkin, spices, kosher salt, and 2 cups of the flour. Stir to combine. Place the bowl on the stand mixer, and attach the dough hook. Add another cup of flour to the dough, and knead on medium speed for 5 minutes. If your dough is still sticking to the side of the bowl, add more flour, half a cup at a time, and knead for a minute on medium speed until a ball of elastic, but not sticky, dough forms. Transfer the dough to a bowl sprayed with nonstick spray. Coat the top of the dough with nonstick spray, and cover with plastic wrap, then a dark-colored kitchen towel. Let the dough rise for an hour. Punch the dough down and divide into 12 equal-sized balls. Roll each piece of dough into a tight ball, then poke your finger through the center and create a 1- to 2-inch hole. Place the shaped bagels on a baking sheet lined with parchment paper. Mist with nonstick cooking spray, cover with plastic wrap and a kitchen towel, and let sit for 15 to 20 minutes. At this point, you can either refrigerate the plastic-covered bagels for up to 48 hours, or you can boil and bake them. When you are ready to bake, preheat your oven to 400 degrees. Fill a dutch oven or other large pot two-thirds of the way with water. Once the water reaches a rolling boil, add the baking soda. Be careful, the water will bubbly rapidly. 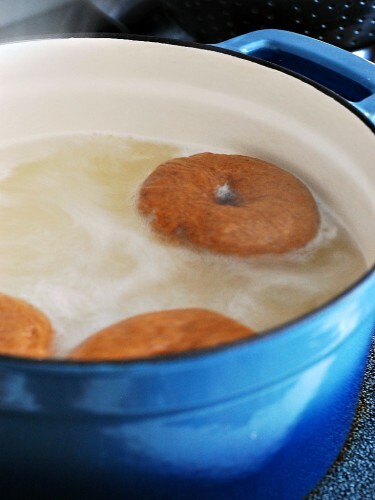 Drop in two or three bagels (whatever will fit comfortably in your pot) and boil for one minute. Gently flip the bagels over with tongs or a slotted spoon, and boil for another minute on the second side. Remove the bagels and place back on the parchment paper, and repeat until all the bagels are boiled. Place the baking sheet in the oven for about 15 minutes, until the bagels are dark golden brown on top. Don’t forget to check out all of today’s fabulous fall foods! Thank you for hosting SundaySupper! These bagels look divine! Now that I know how to make them, I won’t be visiting Dunkin Donuts anymore. (That’s for sure!) Bonus: We will be stocking up on these throughout the fall! Thank you for sharing! I still have not made bagels and they are on my bucket list. There’s nothing like a good bagel for breakfast either. This is such a great one for fall. Mmmmmm .. . I don’t think I’ve ever had a pumpkin bagel, but now I really want one. Especially with that cinnamon cream cheese you describe. Love bagels, but have been too intimidated to even think about trying to make them myself. You step-by-step instructions make me want to try!!! Do you know, I have never made a bagel?! Thanks for showing me how, particularly with such a scrumptious fall flavor! Thank you so much for hosting this week! Thanks so much for hosting us this week! I know it’s a lot of work. Your bagels are PERFECT for autumn!! This recipe makes me want to run out right now and make these bagels. So much yum! I’ve never made bagels before, even though I eat them all the time. 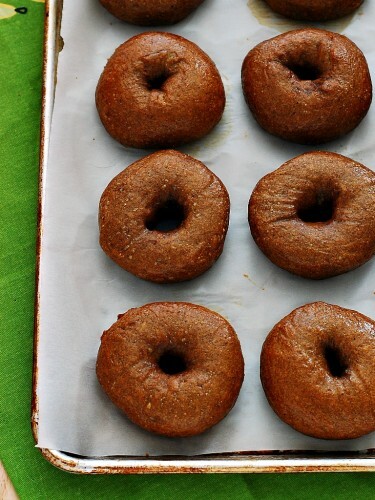 Pumpkin bagels sound heavenly! 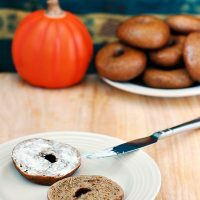 Oh, boy, does this combination of pumpkin bagels and cinnamon cream cheese sound like the perfect way to welcome in the new season. Thanks SO much for hosting us on this busy Sunday!!! Being a Jew from New Jersey, I totally understand the importance of a good bagel, hahah. These sound like they could pass the test! I haven’t had pumpkin bagels in years! Thanks for the recipe! 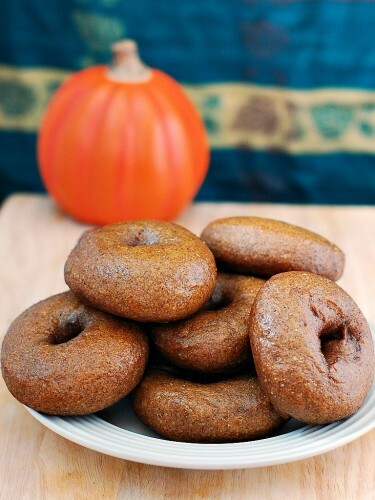 These look amazing, I’ve been wanting to make pumpkin bagels for about a year now. And thank you so, so much for hosting!! !